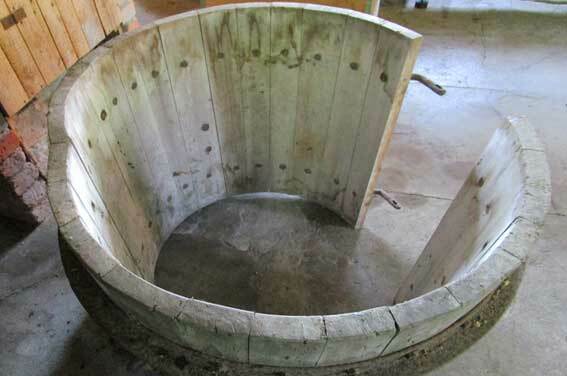 The pot, or the ladle, actually stands inside the furnace and in which the glass melt is contained. The pot is subject to the harshest conditions, not only by high temperature but molten glass is very corrosive. The pot walls are 5-10 cm thick and by the end of the working day it is time to charge the pot with new material. So the wall is about 1100 degrees and then you suddenly fill the pot with cold pellets. Compare to bringing a 300 degree ceramic bowl straight from the oven and filling it with cold water from the tap. The glass pot is exposed to this treatment daily. Once the ladle is full of cold glass pellets the heat is raised in the furnace - burners are turned up of electrical heaters are used. Originally the pot wall was some 1100 degrees throughout. Then you cool the inside by the cold pellet charge and then again you over-heat the outside to get the melting going. Daily. The picture, all black-and-white pictures, is from Steenberg & Simmingsköld, Glas, 1958, shows open pots and a covered pot. 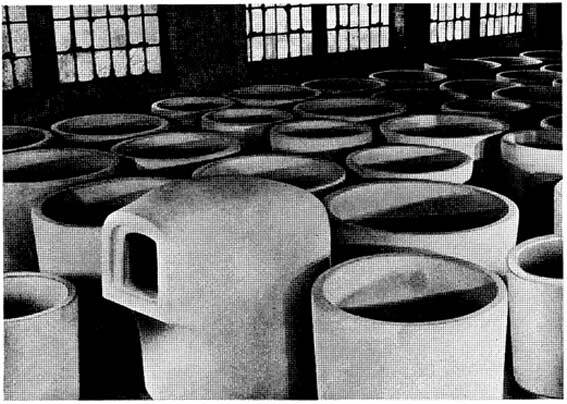 Covered pots protect the molten glass from bits of insulating brick that might fall from the furnace roof. From the chemistry lessons in school some of you some of you might remember that acids easily dissolve acidulous materials and vice-versa: bases tend to dissolve alkalious substances. This holds true for glass too and different types of glass are classified as acidulous or as alkalious. Traditional lead-crystal glass is very acidulous and would rapidly destroy a pot made from acidulous clay. Similarly would a simple soda glass melt, say for beer-bottles, just be a murder to an alkalious-clay pot. Traditionally each glasswork made their own pots but it is a laborious and delicate process and by the late 1900's there was only one ladle-making shop left, namely the one in Orrefors (*). Everybody got their pots from Orrefors. But industrial memories of the pot-making are commonplace; the pulverizing mills. Such mills can be seen in most glass-work-municipalities like in the park "downtown" Hovmantorp. The clay for the pots had to meet high demands and it was expensive, so the old pots were crushed and milled together with fresh minerals. 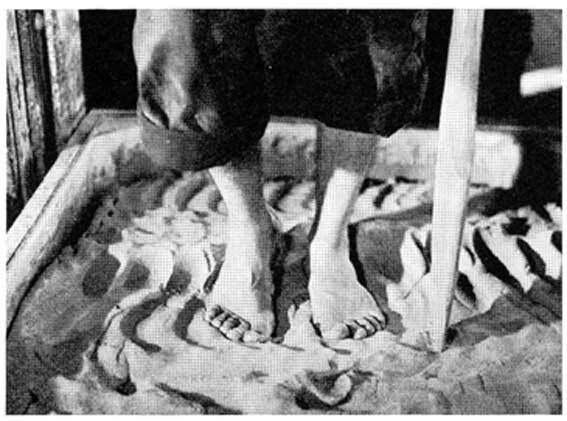 A binder was added to the mixture and the clay was then homogenized by tramping before the ladle was finally hand-made inside a wooden form. The crushing mills, together with the cutting shops, were the glass-making processes that demanded mechanical power. So that explains why, most often, glassworks are placed beside rivers and water-flows. 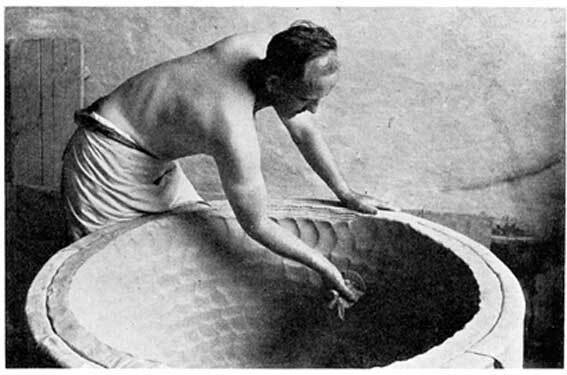 Making the clay, including the process of maturing, the shaping and the slow drying of the pot took about one year and only after that could the pot be "tempered". We have two moulds for glass pots in our museum. They are openable wooden "rings" without a bottom.